The Large Blue Laced Barnevelder has been in existence in this country for the best part of 20 years. 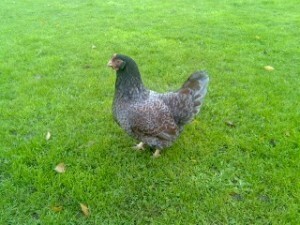 They are in the hands of numerous breeders and are often seen for sale either from private collections or at poultry auctions. They are rarely seen at poultry shows and this is a big disappointment to me personally because I would like to see these birds at show’s and included in the Poultry Club Standards. More recently I have started to create the bantam version with some success and have entered a Bantam Pullet (see photo below) at the National & Federation this year. 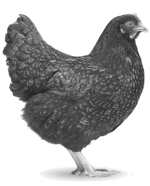 To keep and breed Blue’s requires an understanding on how the blue gene works but in principle it is no different than breeding the Blue Orpington, Blue Australorp, Blue Laced Indian, and of coarse the Blue Andalusian to name but a few. The Blue Laced is double laced similar to the traditional colour but instead of the black and red/brown, they should be blue and red/brown, the black lacing is replaced with blue. For queries relating to the Club or the breed, please contact our club secretary, Mr C. Millward. For queries about the website, please contact webmaster@barnevelderclub.uk.